Good price for a metal gun, my plastic Hoselock one had split after the cold winter left in the shed, worth checking your own as these will go up in the summer, looks like B&Q are selling the same one for £24.98, good reviews too. I've bought the plastic version last summer and mine also split so now leaks from the handle rendering it close to unusable. This metal version will hopefully be better built and last a little longer! The one offered here has SIX watering patterns and the Screwfix on has SEVEN. This does get a bit silly doesn't it. Glad I bought the Silverline one at £3 when it was on offer. Works perfectly. Voted hot as it's a good price for a metal gun. I find Wilko's own are pretty good, never had issue with their hose attachments/connectors. Can pick them up in store too. 1. RRP is a joke. 2. Modern Hozelock stuff looks great, but is appalling quality-wise. 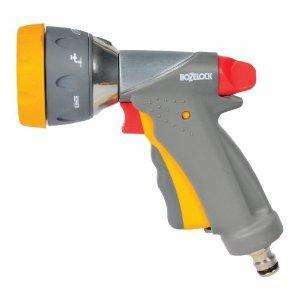 Voted hot as it's a good price for a metal gun.I find Wilko's own are … Voted hot as it's a good price for a metal gun.I find Wilko's own are pretty good, never had issue with their hose attachments/connectors.Coil hose & 7 pattern spray gun here for £9.98Can pick them up in store too. Is this compatible with hoselock stuff or do you need to buy an adaptor? Our plastic one is split too - just got it out of the garage today and water is just jetting out of a crack in the handle - sounds like a pretty serious design issue if there are a lot of people having the same problem. Very true. Just put your thumb over the end of the hose! Should that read - Just put your thumb over the end of your hose? Got it in store so no postage. Not having a pop at the deal here but can someone explain to me how this is better than the similar designed one i bought from poundland this week? The one i got has Jet, Soaker, Mist, Vert, Flat, Shower, Cone settings. The quality seems quite good, ie no leaks and fairly robust. I think even if it lasted me a month before replacing i would have gone a whole year before it has cost me the same as this one. I got a green plastic no name version very similar from asda for £2 last week, and it works a treat, highly recommend it. Replaced a metal one I got from lidl which leaked through the lever which was also more expensive. Every winter mine crack had 4 in 4 years. Crap build quality, after this one breaks I'm using me thumb! I'd rather spend £3 on a non branded plastic one & replace when necessary. Got the full metal one from Home Bargains in Bilston, last summer, for 4.99. Only difference is the Red bits are grey. I have this and it is excellent, worth paying extra for and wont split if it freezes. Does it fit to hoselock fittings? really tempted if it does. At that price you could get one for the head groundsman and another for the butler too. I doubt that it'll still be going after 13 years though, so Poundland is a better buy, just buy a new one each year. If I'm that worried about it freezing, I can bring it indoors for the winter or let it hibernate with the tortoise. Every winter mine crack had 4 in 4 years. Crap build quality, after this … Every winter mine crack had 4 in 4 years. Crap build quality, after this one breaks I'm using me thumb! to all the negative doom-mongers, it comes with a 3 year guarantee, just dont leave it in the shed in winter! I bought this a couple of years ago for about £20 and have been very pleased with it. Like anything else, it lasts better if you look after it and take it off the hose and put it away each time you use it. Cracking deal at this price. Much better than the cheap plastic one. I bought one of these after my plastic Hozelock one split. Both lasted less than a year. On this one, although the body is made of metal, the trigger is still plastic and that's what broke. Not buying Hozelock again. Price is OK though. I have this and it is excellent, worth paying extra for and wont split if … I have this and it is excellent, worth paying extra for and wont split if it freezes. Does nobody else put their hose accessories away over the winter, or is it just me? These are rubbish quality these days. I got one of these from Amazon last year and it was broken in a few weeks use. Mine split as well. Have wrapped some tape round it to see if it will help, but not tried it yet. Bloody hell glad it wasn't just me. Had a plastic hozelock one in the shed over winter, got it out to hose the garden and got drenched from a split. Might look at getting this if it'll last a winter as the other hozelock one cost about 8 notes on its own. Thanks for the advice, guys - was considering one of these, but I'm not wasting £13+ on something that only lasts a couple of years. Even if it has got a 3 year warranty you can be sure they'll be wriggling their way out of it with weasel words. Hoselock stuff is grossly overpriced for what it is - cheap plastic. Even the so-called 'metal' stuff has key components made from cheap plastic so that it fails after a short time. That's how Hoselock make their money, I suppose, but they're not having any more of mine. Decent price - I have this metal model above, my grandad has the plastic Hozelock one, we live virtually next door - so exact same conditions thru winter. Just started to use again after both been left out all through winter - his plastic has a hairline split down the handle and managed to soak my grandma hehe. Whereas my metal one is still going strong - have just ordered them one of these.